Why should you join AEG? Annual Meetings and Specialty Conferences provide you with the technical knowledge and continuing education you require to advance your career. Attendees report that AEG offers the best field trips in the industry. AEG excels at providing continuing education and CEU/PDH opportunities locally, nationally, and internationally that are based on case histories and real world experience. Members regularly boast of lasting friendships developed with other AEG members. AEG prides itself on its vast network of focused professionals that support one another to reach their goals and promote the profession. Regional meetings are often hosted with other affiliate organizations, allowing AEG members the opportunity to network with an even larger pool of professionals. AEG NEWS summarizes events, local news, brief case histories and issues affecting our profession. 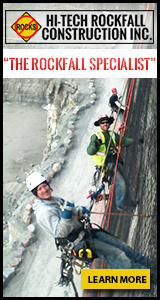 Environmental & Engineering Geoscience is AEG's peer-reviewed technical journal. Annual publications include the Annual Report and Directory and the Annual Meeting Program with Abstracts. The AEG Insider, AEG's weekly news brief, brings you timely geoscience news stories and updates on events and activities. AEG publishes several Special Publications and regularly updates technical resources. AEG has Chapters throughout the United States and internationally, offering regional opportunities to learn and network in a casual yet professional atmosphere. Our volunteers are our greatest asset for promoting our profession and the organization. In return, volunteers gain valuable business skills such as project management, delegation, marketing, and strategic planning. AEG has several online opportunities to promote job openings and keep up to date on the latest happenings in science and industry. AEG's Career Center is open to the public, and our social media sites, including LinkedIn, Facebook and Twitter, are regularly updated with new information. Our student members are provided a forum to present their research and network with other students as well as academic, government, and private sector employers. Best of all, students can take advantage of most AEG sponsored activities at reduced or no cost. AEG promotes the value that environmental and engineering geologists bring to each project. We advocate on behalf of our members to engineering groups, other geoscience organizations, and local and national legislative leaders. AEG supports members' efforts to establish, enhance, or defend professional licensure through funding, communication, and collaborative efforts. Members enjoy discounts on publications, registration fees, short courses, and field trips. Members have access to discounted professional liability insurance that is specifically designed for environmental and engineering geologists. Members can participate in a variety of health, dental and disability insurance programs. AEG members can join IAEG (International Association for Engineering Geology and the Environment) when they sign up for or renew their membership with AEG. Please visit www.IAEG.info for more details. For additional details on how you can become a part of this great network visit our join page.